Nestled between the buildings and storefronts of Milwaukee avenue between Damen and Wood, the first night of the 2010 Wicker Park Festival offered a treat for rock fans: legendary post-punk act Mission of Burma and beloved local legends Cap'n Jazz back-to-back on the same stage. Mission of Burma's set was as good the second time around as it was at Subterranean Friday night (read a review of that show here). They put on a fantastic live show, full of menacing energy and excitement. Since I recently reviewed them, I won't go into too much detail--suffice to say, their set at the festival Saturday night definitely confirmed that when a band rocks that hard, it never goes away. I'll admit, I had absolutely no idea what to expect from recently-reunited 90s Chicago punk act Cap'n Jazz's live show. I knew that tickets to their club shows in town have all sold out in a ridiculously short amount of time, and if their their set Saturday night was anything close to typical, I certainly know why. They were phenomenal. 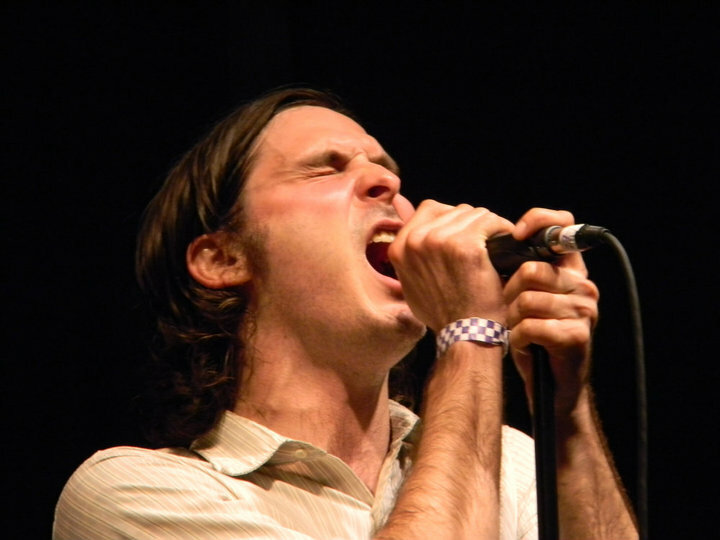 Frontman Tim Kinsella's vocals are raw and very rough around the edges--bordering on harsh, but with an intensity mirrored by his hypnotic physical performance onstage. Clutching the microphone and screaming into the mic, he often leaned over the edge of the stage into the audience, even falling face-first into it in order to have the audience push him like a domino back onto the stage. It was impressive to watch a set that intense from start to finish--it was as if he put every single ounce of energy he had into every second of his performance during the songs. The drums (courtesy of Tim's brother Mike Kinsella) were wild, the bass (Samuel Zurick) was booming, and guitar work (Victor Villareal and Davey von Bohlen) was very tight. The set was full of raw energy, and the audience and band fed off each other in one of those rare, sparkling moments that sometimes happen during live shows that makes people want to go to them in the first place. The band themselves seem to be a bunch of endearing, mild-mannered guys--clearly amused and excited by the size of the crowd, they took pictures of the audience on their phones during soundcheck. In response to fans' shouts between songs of "I've missed you, man! Where have you been?" Tim laughed and said "I've been around--It's not like I've been hiding," detailing his usual whereabouts around the city, and the band laughed about his getting "old" and tucking in his shirt. All were clearly having a great time playing for a big crowd of fans both new and old. The mosh pit in front of the stage kept getting bigger during the band's set, until it had spread over most of the area in front of the stage, with fans slamming into each other, throwing things, crowd-surfing, stage-diving, pumping their fists in the air, and generally having a good time. A particularly rowdy crowd favorite was the band's cover of the 1985 A-Ha hit "Take On Me"--complete with Kinsella's voice dropping out and letting the fans take over on the high falsetto note that everybody always sings on that song. I'd tell you not to miss their next live show (if there is another one), but I'm hoping to actually get a ticket, myself. Check out the photo slideshow here! Of course, it is really fantastic and nice enjoyment music party and they put on a fantastic live show, full of menacing energy and excitement and do't miss it.